Got leaves? All Wood Village residents are welcome to utilize the Leaf Drop-Off Event provided by the city. Starting November 1st to December 31st the Leaf Drop-Off Event will be held at Donald L. Robertson Park. 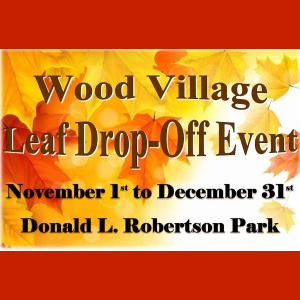 Learn more details about Wood Village's Leaf Drop-Off Event below. The cool, windy fall weather causes trees to shed their leaves which can clog storm drains causing localized flooding and deteriorated pavement. Raking or depositing leaves in the street IS NOT an allowed disposal option. Wet leaves on the street can be just as slippery as snow and ice creating dangerous conditions for drivers and pedestrians. These problems can be avoided by composting leaves and yard debris or putting leaves into your yard debris can for the waste hauler to remove on your regularly scheduled collection day. In an effort to assist you, the City is providing a leaf drop off area during November and December. Please deposit the yard debris loose in the designated area, Do Not Leave bags or containers.